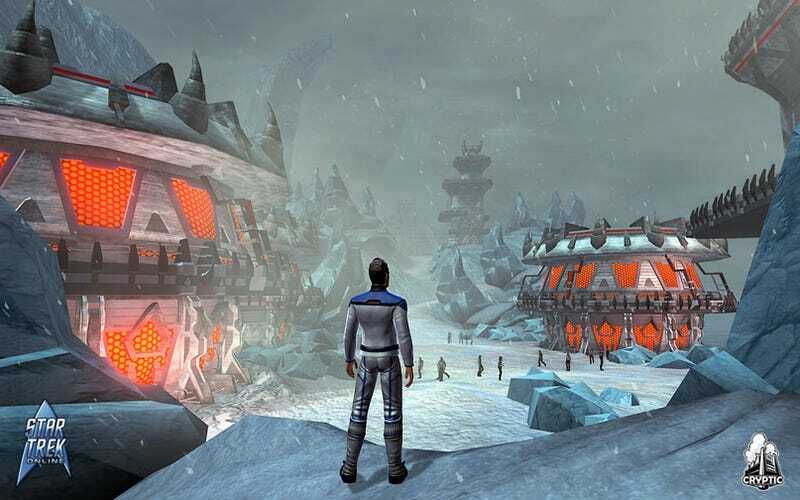 Cryptic has released four new screenshots for Star Trek Online, a couple of which actually show off some of the more intimate locations you'll be able to explore. Most of the screenshots I've seen so far for Star Trek Online focus on various vessels in outer space, and while they are lovely, there's only so much you can do with outer space. It's nice to get the odd glimpse of what we'll see when we actually wander about our ships, or beam down to the planet for a little bit of exploration. Is it sad that the first thought in my head upon seeing the character in the white and blue uniform was how long it would take for those outfits to show up at Star Trek convention? Not on me, of course. No, I'm all Klingon, all the time.